A Wee Burn Beach Club Wedding offers one of the most spectacular beach front locations in the American north east. The Wee Burn Country Club has a rich legacy and for years it has hosted spectacular events for history’s elite. The club itself was named by the famous Andrew Carnegie, who dubbed the location Wee Burn, Scottish for “small stream”. The country club provides two beautiful venues for couples to choose from for their special day. The first is on the grounds of the country club, but the second is located in nearby Rowayton, Connecticut. Here, a private beach club exists for brides and grooms who want a beachfront wedding without having to travel very far. This picture shows the start of a Wee Burn Beach Club Wedding ceremony. 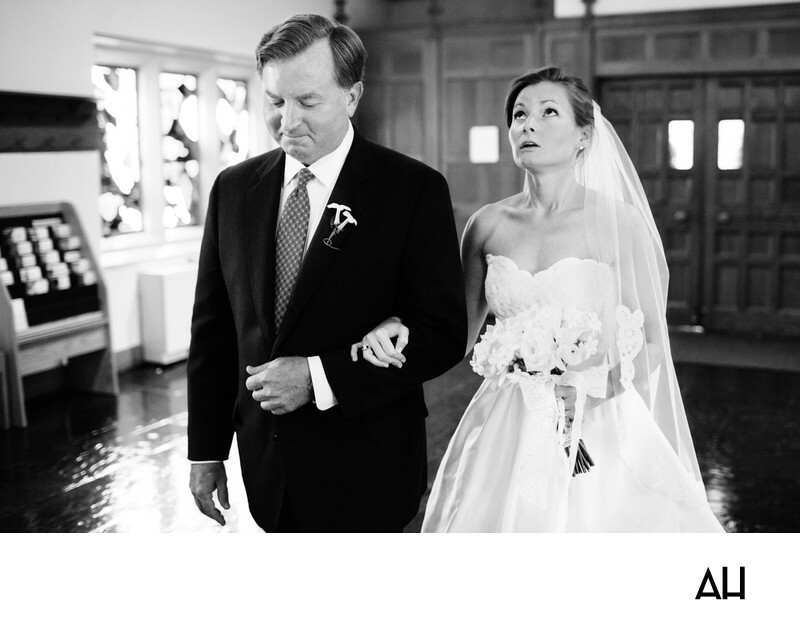 In the image, the bride is slowly walking into the ceremony with her father. The bride is classically beautiful, in simple white gown with a scalloped sweetheart top. Her hair is pulled up, leaving her neck and shoulders bare. A long, sheer veil flows down her back as the bride looks up to take a big, deep breath, before she steps forward into this new chapter of her life. Beside her, her father gazes down. His expression is proud and nostalgic as he prepares to give his “little girl” away. The black and white photograph commemorates the timelessness of this scene -- a father walking his daughter down the aisle on her wedding day. Around them, sunlight dances in the windows, fractured by tree branches; polished wood shines beneath their feet; and a solid wood paneled door creates a simple backdrop. These details of the scene are still significant, but they do not steal the attention of this precious moment.